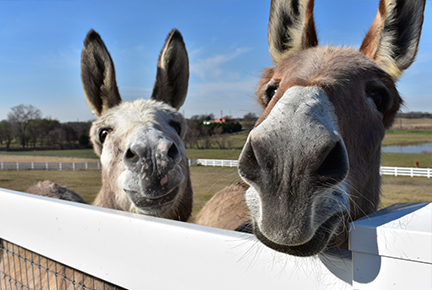 These two donkeys stole our hearts and have come to live the good life with us on our 5 acres of hilltop country heaven in McKinney, Texas. 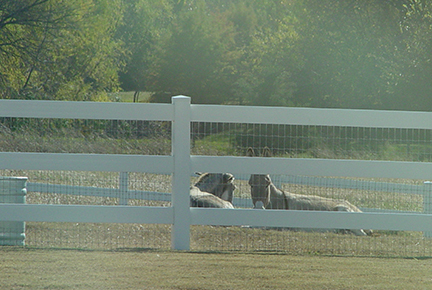 Granny (18 years old, featured on the left) was saved from a Louisiana Kill Pen. She was so emaciated, you could see her every bone and so unkempt that her hooves had grown outward and became broken and painful. 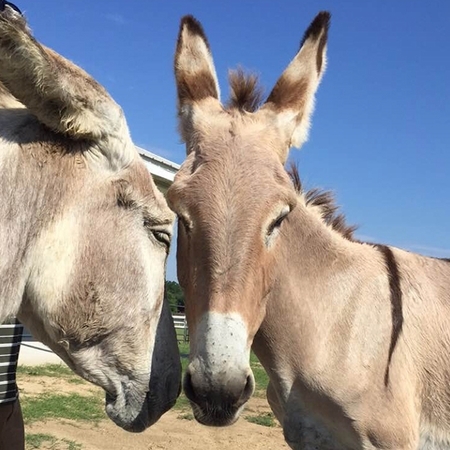 Granny was given her name upon rescue because she is a caretaker to any and every orphaned furry creature she meets - from llamas to donkeys! 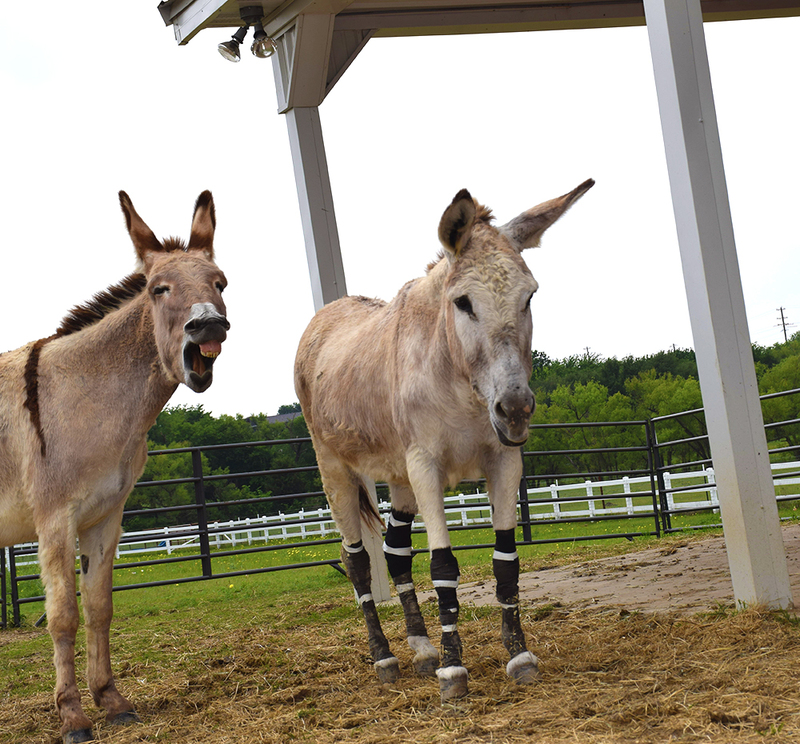 Shadow is one of her orphans (3 years old, featured on the right). 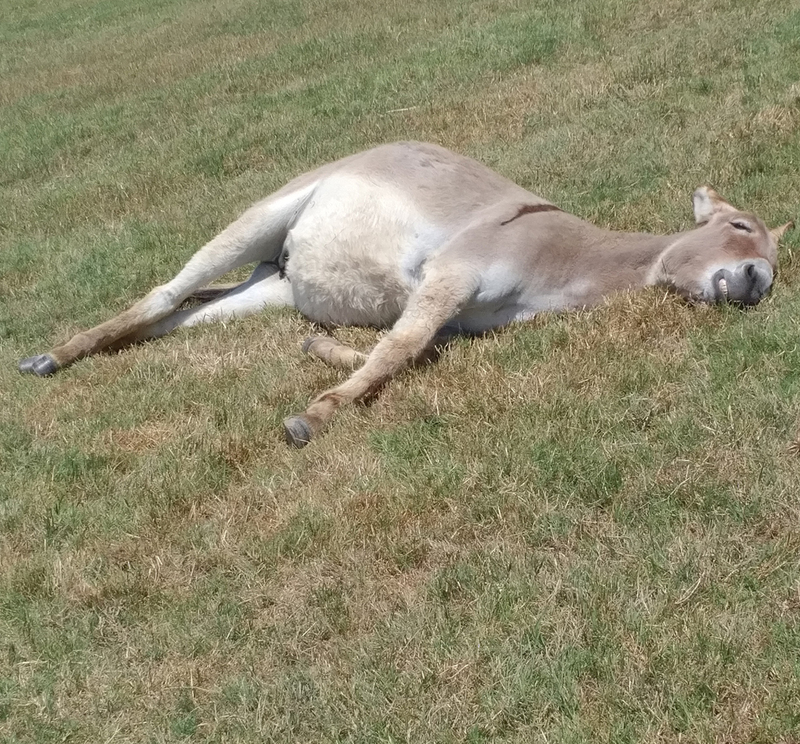 Shadow came starved from a Kill Pen in Boerne, Texas. She came with a baby who was so sick with pneumonia, she didn't survive. Shadow's grief was immeasurable, and she was so scared of humans that no one could go near her. But Granny did! Everything Granny would do (be petted by a human and fed by hand)... Shadow would do. Granny showed her how, and day-by-day Shadow has become trusting and loving and as sweet as pie. These two beautiful ladies are an absolute joy to be near. Their rescuer said she hoped they would find a forever home where they could follow you around as you drink your morning coffee. Well that was music to our ears! Granny and Shadow have handfuls of visitors all day -- with fresh watermelon, apples and carrots in hand. Next week we're all getting equine massage lessons, and their new relaxing lives are about to be taken to 5-star spa resort level!